Mokhtar Belmokhtar, al-Qaeda's man in the Sahara? The alleged mastermind behind the daring kidnapping of dozens of foreign workers at a natural gas facility in Algeria this week, Belmokhtar is also the al-Qaeda-linked captain who held two Canadian diplomats captive for four months in 2009. The daring abduction of dozens of foreign workers at a natural gas plant in Algeria earlier this week has renewed attention on Mokhtar Belmokhtar, the one-eyed, al-Qaeda-linked commander in the Sahara who was the alleged mastermind behind the attack. While his name may not be familiar to the general public, his exploits have made headlines in recent years, in particular his supposed involvement in a series of abductions, including that of two former Canadian diplomats, Robert Fowler and Louis Guay, in Niger in December 2008. "He’s a very serious individual," Fowler told CBC’s The Current with Anna Maria Tremonti. "He didn’t stay with us at our various camps. He would come for an hour or a day or three days. Sometimes he would come and speak to us,sometimes he would not. He was always very business-like…But there was absolutely no doubt that he was the boss and everybody was very anxious to keep him happy." 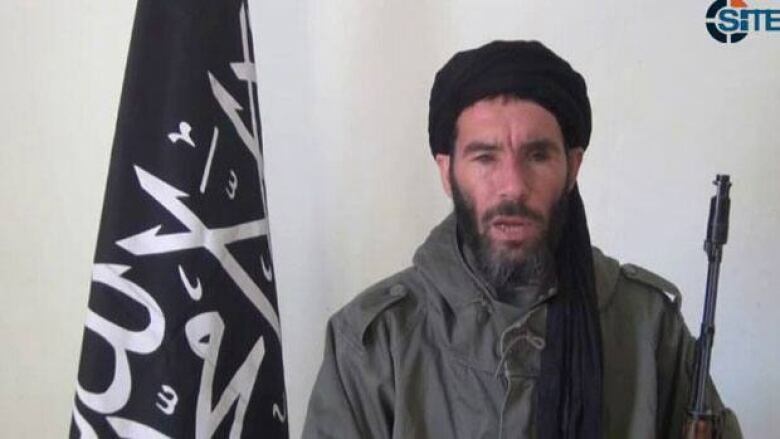 Until recently a key senior commander in al-Qaeda in the Islamic Maghreb (AQIM), Belmokhtar is said to have recently left AQIM after a falling out and now leads his own Islamist group, the Masked Brigade. "He was very independent, he had his own ideas. He wanted to do things with which they didn't agree with," according to Richard Barrett, the former coordinator of the al-Qaeda-Taliban monitoring team at the UN. Based in Mali, Belmokhtar also has a reputation as a smuggler, and had made millions smuggling diamonds, weapons, drugs and cigarettes, earning him the nickname "Mr. Marlboro." He has also been dubbed "The Uncatchable" by French officials. He "is more interested in making money, rather than hard-line Islamist ideology," Jeremy Binnie, a London-based terrorism and insurgency analyst with Jane's Terrorism and Insurgency Centre, told CBC News via email. "His forces or others acting on his behalf were responsible for many of the kidnappings in the Sahara in recent years, with the rest carried out by or for the rival brigade led by Abu Zaid," Binnie said. "Hostages held by Belmokhtar have had a better chance of survival than those held by Abu Zaid." Belmokhtar has been in the desert for years, providing logistical support for the Islamist militants operating in northern Algeria, Binnie said. He is also said to have married into Berber and/ or Arab tribes in northern Mali, thereby establishing strong links with local families. Believed to be in his 40s, Belmokhtar was born in Algeria, and served in the Algerian military. At one point, probably as a teenager, he is said to have travelled to Afghanistan in the late 1980s to help fight in the insurgency against the Soviets. It was during combat there that he is believed to have lost an eye, gaining him the nickname Belaouer/al-Awar (The One-Eyed). But he arrived a little late to the fighting, according to Barrett. The Soviets pulled out in 1989, and Belmokhtar headed back to Algeria. Back home, he joined the Armed Islamic Group, a militant group devoted to overthrowing the Algerian government, which was formed following the cancellation of elections by the army in 1991. Belmokhtar broke from that group to co-found the Salafist Group for Preaching and Combat also known by its French name Groupe Salafiste pour la Prédication et le Combat (GSPC). He was alleged to have been involved in the GSPC's 2003 kidnappings of 32 European tourists. GSPC eventually renamed themselves al-Qaeda in the Islamic Maghreb and Barrett said they had had an agreement with the leadership of al-Qaeda that AQIM would be an affiliate. "Because they were running out of recruits and they weren’t really doing very well and they weren’t getting funding from abroad or anything, they reckoned it would be a very good idea to call themselves al-Qaeda," Barrett said. But Belmokhtar was apparently not happy with the leadership of AQIM, and for being passed over to head up operations. He declared in December that he was leaving to become leader of his own group — the Masked Brigade. He said at the time that he would still maintain ties with the central al-Qaeda organization based in Afghanistan and Pakistan. "He apparently put out a video statement in which he basically said he had cut out the middle management, he considered his new line manager to be al-Zawahiri [the al-Qaeda leader who succeeded Osama bin Laden] and that he wanted to focus on expanding his regional operations," Binnie said. "He also said that he had formed a new unit called Al-Muwaqiun bi al-Dima (Those Who Sign With Blood) and would retaliate against anyone who intervened in Mali."